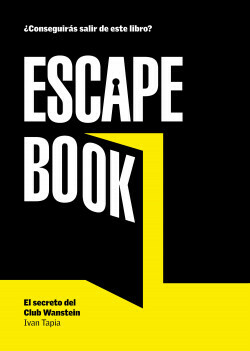 ESCAPE BOOK. The Wanstein Club's Secret. Candela Fuertes is 28 years old and works as an investigative journalist specializing in economic and financial crime. She is trapped in a labyrinth and has just 60 minutes to escape and reveal the secret plans of the businessman Anastás Vecla and the Wanstein Club. The reader joins Candela in her trap and will be forced to draw on all their ingenuity to solve puzzles, optical illusions, conundrums and anagrams to make progress and finally escape both the labyrinth and the book! Universo dos Livros Editora (Brazil), Éditions Solar (France), Heel Verlag (Germany), Salani Editore (Italy), icox (Korea), Czarna Owca (Poland), Planeta Manuscrito (Portugal), Eksmo (Russia), Aurum Press (UK), Kosmos Uitgevers (The Netherlands). ESCAPE BOOK JUNIOR. Lía's Doors. ESCAPE BOOK 2. The Invisible Threat.